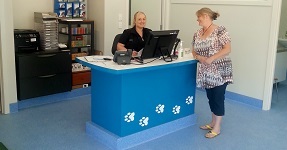 Call us now for the very best pet care in Mclaren Vale and all surrounding areas. And remember to ask about our superb dog training services too! 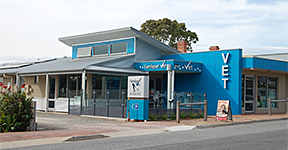 Our professional and caring staff at Mclaren Vale veterinary hospital strive to provide the best veterinary medical, dental, surgical and personal care possible. Dr Nick West is the owner of Familypet Vet. He graduated in 1972 at Sydney University with Honours. He started O’Halloran Hill Veterinary Practice in 1975, which he sold in 1987. 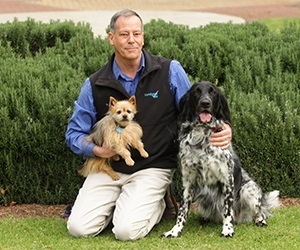 When he moved with his family to McLaren Vale, he opened the Mclaren Vale Familypet Vet . Five Years later he opened the Coromandel Valley Clinic. Nick still lives in McLaren Vale close to Seaford with his wife and daughter, he still enjoys General Practice after 43 Years. Nick has 2 dogs. Ani and Smidge. He loves the outdoors and occasional fishing when he can find the time. things that SA has to offer. I am one of those people who spent most of my childhood wanting to be a vet. and challenges that it provides. acapella singing group and also in the odd musical production in the city. I am looking forward to meeting both you and your furry animal family. Dr Lyndsay Smith grew up in the Adelaide Hills. She graduated from the University of Adelaide in the inaugural class of veterinary students in 2013. 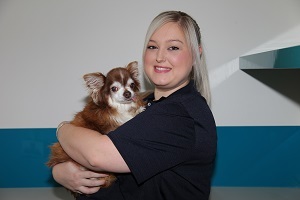 Since then she has spent several years working in a small animal clinic north of Adelaide and then spent a year in a very busy coastal practice in Western Australia, before settling down on the Fleurieu Peninsula. She now lives in Seaford with her 3 Australian Shepherds. 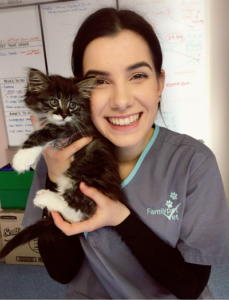 Lyndsay’s veterinary interests are reproductive medicine and neonatal care. In her spare time she can be found at dog shows showing her Australian Shepherds, or taking the dogs for walks on the beach and in the bush. 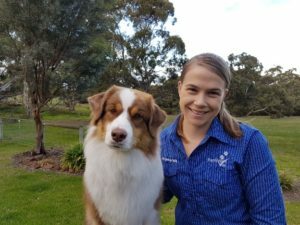 Dr Arielle Bridges qualified at the University of Adelaide and began her veterinary career in Birdwood and Woodside in the Adelaide Hills before joining the team at Familypet Vet. Arielle grew up in Willunga and went to high school in McLaren Vale so is very excited to be back servicing the local area! Arielle has also spent some time working with animals in Africa and Indonesia. Arielle is particularly interested in animal dentistry ahd surgery and enjoys the challenges being a vet presents on a daily basis. In her spare time, Arielle loves to keep active whether it be playing basketball, hiking Mt Lofty or walking her dogs (Chad and Dizzie the golden retrievers and labradoodles Zailee and Willow). Arielle has a keen interest in the outdoors and a passion for AFL football. When she isn’t outdoors Arielle loves spending time in the kitchen and baking desserts for friends and family! 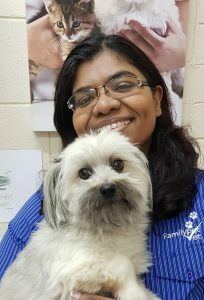 Dr Sarah Jayalamar joined the Familypet Vet team in January 2019. She ran her own practice for 10 years in Malaysia before immigrating to Australia. Sarah enjoys every aspect of small animal veterinary science. In her spare time she likes watching her children and husband play soccer. 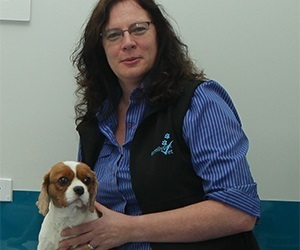 Dr Anne Millburn qualified in Belgium and has worked in England as a Veterinary Surgeon for 18 years. She obtained her certificate in Veterinary Practice Management in 2004 at the RCVS in London. Anne moved to Adelaide in 2007 with her husband, two children and their ‘Cat Adoption League’ cat Trouble. 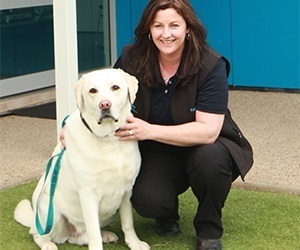 Anne joined the Familypet Vet team at McLaren Vale and Coromandel Valley in 2009 as practice manager. Kelly Quince has been working as a Nurse since 2003. She completed her certificate IV in Veterinary Nursing in 2005 and joined the team at McLaren Vale. She has got a one-eyed, ginger cat ‘Petey’, who came into work as a stray and is now a treasured part of my family. The highlight of her career so far, was a transfer to a veterinary clinic in Langkawi, Malaysia, where she spent a week assisting in the sterilisation of feral cats. 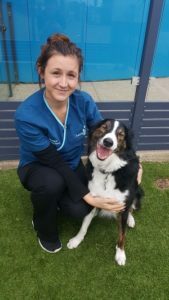 Hello, my name is Rebecca Dunn I have been Veterinary Nursing since 2008 and working with the Familypet Vet team since 2011. Veterinary nursing is a challenging and rewarding career which will never give you the same day twice. The satisfaction of reuniting a sick or injured pet with their loving family is incomparable. 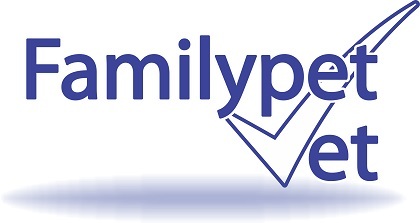 At Familypet Vet I’m proud to work alongside a dedicated and committed team of individuals who give 100% to their jobs every day. As a vet nurse I love all areas of my job but my particular interests are pet nutrition and volunteering my time to raising orphaned and homeless animals. My husband Ryan and I live in the beautiful Aldinga Beach area with our beautiful daughter close to Seaford with our chihuahua Lara ,bull mastiff Jemma and cat O’Mallee. 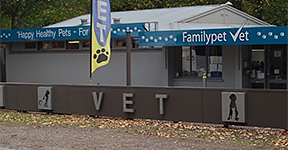 Lindsay Macleod started working for Familypet Vet in 2005 after having done work experience for the practice a few years while finishing off high school. 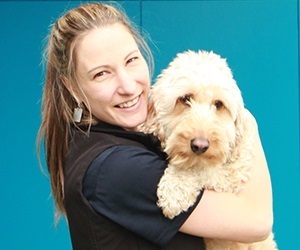 Lindsay has been nursing at the Coromandel Valley veterinary clinic until just recently where she has been nursing both at Coromandel Valley and Mclaren Vale clinic. Lindsay lives in Mclaren Flat with her husband Alex and their twin daughters. Their rottweiler Bruce, Baggins the rabbit and a lorikeet named Harold. 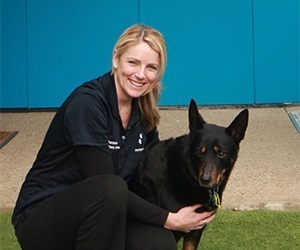 Danielle Harden has been a Qualified Veterinary Nurse at McLaren vale Clinic for almost 7 years . Dani started her nursing career in 1997 in Port Noarlunga and also worked on Kangaroo Island and obtained a wide variety of experience in large animals and marsupials. She worked at the RSPCA as a supervisor after moving back to Adelaide. She will be continuing with puppy pre-school classes at the McLaren Vale clinic. Dani lives in the southern suburbs with her husband and 2 daughters and her 2 Sons. Dani has a Border Collie Miley, as well as a kelpie. 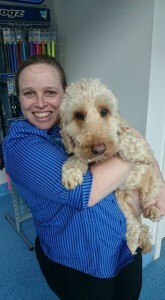 Monique Semmens (Moni) joined the team at Familypet Vet McLaren Vale as a Qualified Vet Nurse. Moni previously worked in a veterinary Hospital for 7 yrs. Her role includes surgical, emergency and critical care. She lives on her beautiful property with her husband and young son. 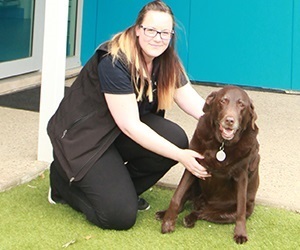 Tayla Sims has been working at FamilyPet Vet McLaren Vale Vet Clinid and Coromandel Valley Vet clinics since 2013 after being extremely lucky to join the practice after doing work experience at the McLaren Vale Clinic. 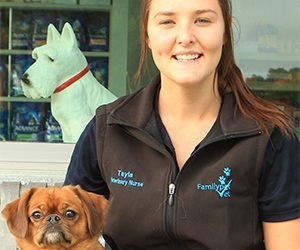 Tayla is now doing her Certificate IV in Veterinary Nursing while living at home with her family and her best friend Simba her puggle. Her other family pets are their border collie, Nan, Kitty the cat, Tweetie the bird. I joined the team in 2014 after being lucky enough to get a position in the workplace after doing a couple weeks worth of work experience in 2013. I am furthering my studies at Tafe Sa to complete my Certificate IV in Veterinary Nursing. I currently live in Woodcroft with my two beautiful labrador crosses Holly and Buddy and my two rats Remi and Ruby. Morgan has been vet nursing since 2011. After getting her qualifications at a different vet clinic in Adelaide she worked in the animal health centre at the Adelaide Zoo. 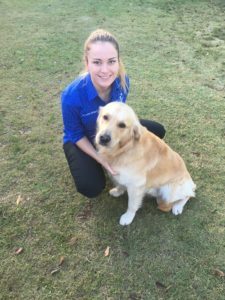 Morgan joined Familypet Vet Mclaren Vale in 2015. Growing up on a farm in McLaren Vale, she has always had a love for all animals. She has three dogs that keep her busy, Bam the Border collie, Ruby the Heeler and Tilly the kelpie.